HAMILTON, ON – Garden Brewers has announced the debut of a new series of limited edition small-run beers – aka “beers that are made maybe once, maybe every-so-often, but not regularly, and never hang around for very long” – that are being brewed under contract at the Niagara College Brewery. Dubbed Now In Bloom!, the series is kicking off with Petal-Pusher Elderflower Lager, a 5.2% abv and 16 IBU lager made with a combination of Canadian 2-Row, English Maris Otter, Canadian Toasted Wheat, and German Acidulated malts – with the latter adding a slightly tart character to the beer – and Pacifica & Galaxy hops along with Elderflower blossoms. Elderflower is hard to pin down in terms of its exact flavour – it seems to gently move and change as soon as you figure it out, like trying to fly a kite in a really soft and gentle breeze. As a result, it is sometimes simply described as “Tasting Like Summer”. We love that! 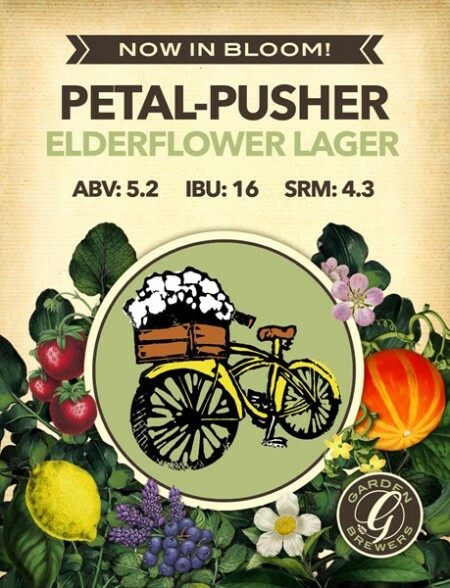 And we like to think that our Petal-Pusher, with its classic, clean lager beer character, notes of lemon, orange, and tropical fruit, and its sharp, biting finish, tastes just like summer too! For more information on the beer as series, see the detailed blog post on the Garden Brewers website.